Sproutlings will be closed Monday, January 21st for Martin Luther King Jr. Day. For a print-out of all of Sproutlings’ 2019 holidays, please visit our website. -As the weather gets colder, please remember to pack mittens/gloves/hats etc. for your child and a proper winter jacket. Labeling winter accessories is extremely helpful so that teachers can make sure all belongings go home with the right child. We would like to wish our families a Happy New Year. We would also like to welcome our new Peapods and their families to our room. We are all very happy to have you! We have had another great week in Peapods II! Our song of the week was “Jolene” by Dolly Parton. Whenever it came on, we stopped what we were doing and started dancing. Our book of the week was Would You Invite a Shark to Your Wedding? by Ginger Pate. For sensory, we mixed paint with baby oil in a plastic bag, It was fun watching the colors swirl. For art, we made pandas and painted snowflakes to hang from our ceiling. Stop by the classroom to see them! We have been practicing our gross motor skills on the balance beam. We have been splashing water around in our sensory bin. We love blowing bubbles! Some of our friends are working on their colors and shapes. We practice identifying them all day long! We had a fun week in the Beanstalk and Beanstalk II classrooms! We are investigating clothing. We designed our own clothes by drawing pictures. We imagined what colors and patterns they would be. 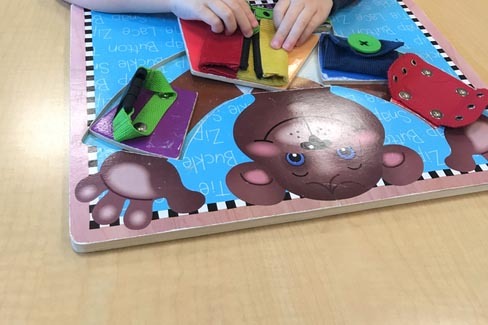 We practiced our zippering, buttoning, and tying skills using our friend Mr. Bear. We continued practicing counting up to ten. Our older friends in Beanstalks II can count even higher! Our book of the week was Llama Llama, Red Pajama. In Saplings this week we continued our study on clothes. In large group we answered the question, “Where do we get our clothes?” The kids came up with a lot of great answers, from the toy store to the clothes store. Our stories we read this week were A Pocket for Corduroy by Don Freeman and Something from Nothing by Phoebe Gilman. In literacy this week we continued our handwriting practice. We worked on forming the letter “L” with play dough and wooden sticks. As a class we also came up with words starting with the letter “L.” In math, we graphed how many buttons we had on our clothes. We also practiced one to one correspondence and number recognition through games and activities. Next week we are going to be finishing up our study on clothes. Have a great weekend! This week the children in Pre K 4, we began a study on clothing. The children learned how clothes were made and through journal writing, the children shared what their favorite type of clothing to wear was. We matched our upper and lower case letters by using lowercase letter clothes pins to hang uppercase letter t shirts on a clothes line. Using tally marks on a graph, the children documented what types of clothing they were wearing. We learned for example, that more children had on long sleeves verses short sleeves and more children were wearing shoes with Velcro verses shoes with laces. In celebration of National Pizza Week, the children enjoyed creating their own pizzas using English muffins, mozzarella cheese and pizza sauce!